Stumbling stones remind us of the names of people who fell victim to Nazi terror. 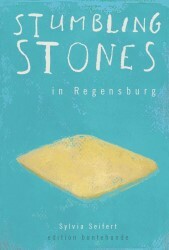 In order to keep the memory of them alive, Gunter Demnig, the project initiator, has laid more than 200 stones in Regensburg so far - for Jews, Sinti and Roma, disabled people, Jehovah's Witnesses and people in resistance. This book tells their stories in an exemplary way and describes how the Nazi regime deprived them of their rights, harassed, tortured and finally deported then. 75 years after the Wannsee Conference, when the Nazis abandoned all sense of humanity, these biographies honor the victims and encourage us to stand up for peace and charity in the 21st century.